Han Solo: Now that’s my kind of smuggler! Alright, I’ll admit it. 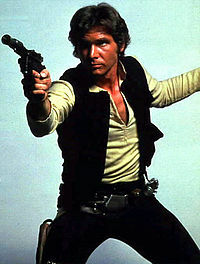 When I think of smugglers, the first thing that comes to my mind is Han Solo. In reality, though, smuggling has a long history. Smuggling refers to the illegal transport of goods or persons, usually across international boundaries, in violation of domestic or international law. Smuggling is most often motivated by a desire to avoid paying taxes, but can also involve illegal immigration or emigration (e.g., human trafficking) or the trafficking of illegal substances (e.g., drugs, weapons, or counterfeit goods). Over the weekend, Panamanian prosecutors announced they would file charges against 35 crew members of the Chong Chon Gang, a North Korean ship passing through the Panama Canal. 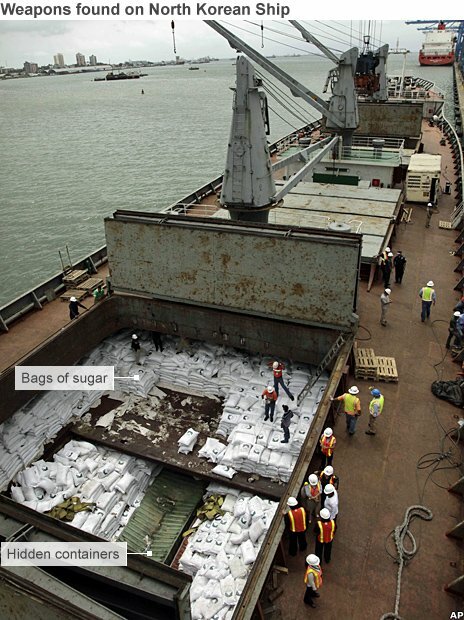 The ship’s manifest indicated it was carrying 10,000 tonnes of sugar bound from Cuba to North Korea. But inspection of the ship’s cargo found 240 tonnes of weapons, including two Volga and Pechora anti-aircraft missile systems, nine missiles “in parts and spares,” two Mig-21 Bis and 15 engines for those airplanes. The weapons were found inside containers hidden within the sugar shipment. Secret compartments in the Chong Chon Gang. Cuba described the weapons as “obsolete defensive weapons” and contended they were headed to North Korea for repair. The Panamanian government described the same weapons as “sophisticated.” The MiG-21 is a fighter jet with a limited range that first entered service in 1959. The missile systems in question are similarly dated and easily evaded by current US aircraft technology. Given this, the description of the weapons as “sophisticated” might be a bit of a stretch. Regardless of the quality of the weapons themselves, it seems clear that the shipment was undertaken in violation on a United Nations Security Council embargo on weapons shipments to North Korea. United Nations Security Council Resolution 1718 (2006) requires that all United Nations Member States “shall prevent the direct or indirect supply, sale or transfer to the DPRK, through their territories or by their nationals, or using their flag vessels or aircraft, and whether or not originating in their territories, of…battle tanks, armoured combat vehicles, large calibre artillery systems, combat aircraft, attack helicopters, warships, missiles or missile systems.” More expansive sanctions are imposed by Resolution 1874 (2009). North Korea has a long history of flaunting United Nations resolutions and has often sought to exacerbate tensions with the broader international community. North Korea might also be seeking to reduce their reliance on Chinese support by expanding the number of trading partners it has. What do you think? Will the discovery of Cuban weapons bound for North Korea undermine negotiations to normalize relations between Cuba and the United States? Or will Cuba’s explanation mitigate any negative diplomatic effects? Take the poll or leave a comment below and let us know what you think.